My yard is super scruffy right now. It is super bad for a multitude of reasons but I shall focus on just two things right now -the lawn and the apple trees. 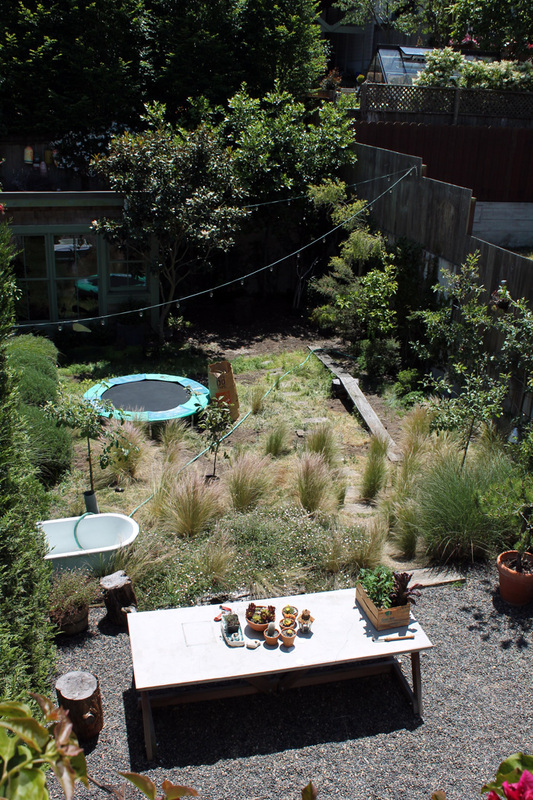 (I say "lawn" but it really is just a patch because I have a typical San Francisco lot, leaving my back yard at 25 by about 60 feet). After complete and undeniable failure, I have abandoned my hopes and dreams of having a luscious molate lawn. For a long time I just couldn't quit molate, as evidenced here. Now, finally, I have accepted the agony of defeat and am contemplating a new, far-fetched plan. I'd love to have a meadow of grasses and wild flowers. I feel this might be possible because whereas the "grass" area of the yard is covered in weeds and crappy weed grass that I can't seem to exterminate (I only pull it out compulsively, I don't resort to round-up or other pesticide/poisons), there has been a good deal of self-propagation by the Mexican feather grass and Santa Barbara daisies. I'd honestly be happy with an entire yard that looked like that. 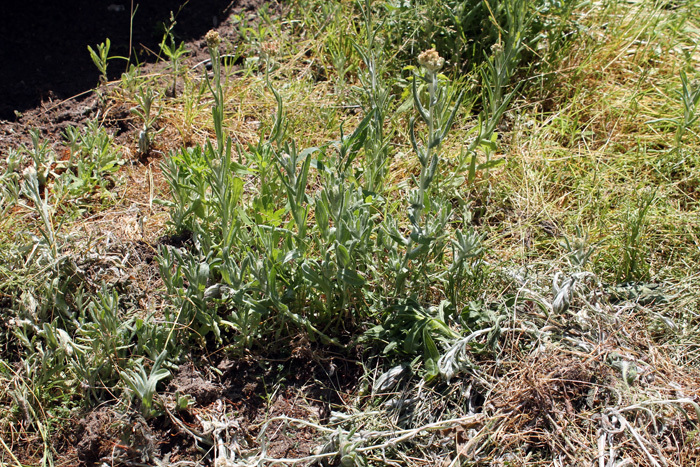 I could pretty easily and economically plant more feather grass and just let that take over (while at the same time continue to pull the crap grass and weeds) and figure out other grasses and flowers to mix in. 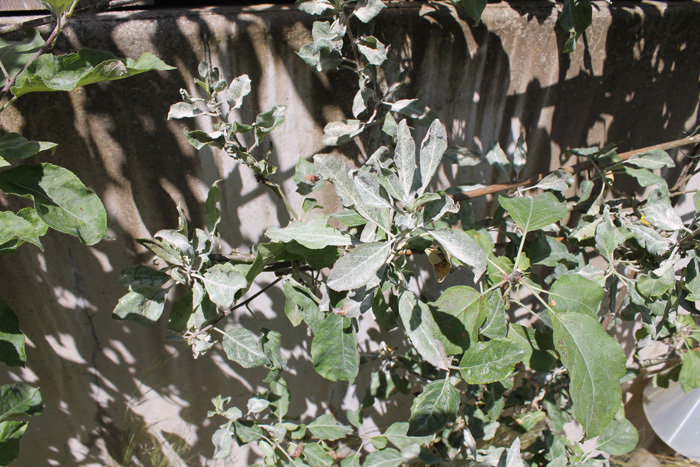 Secondly, the apple espaliers are overgrown and covered in white powdery mildew. 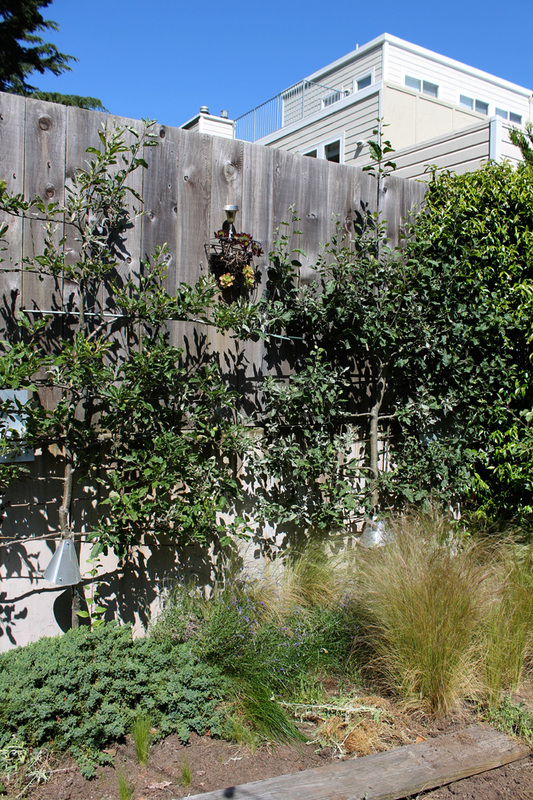 Try as I might, I still have not completely figured out how to prune these things. I understand the budding pattern of the tree on the left (lateral), but the one on the right still mystifies me. Is it a lateral or a terminal or friggin both? Not knowing makes pruning this sucker somewhat nerve-racking. Additionally, flowering was very stretched out this year. 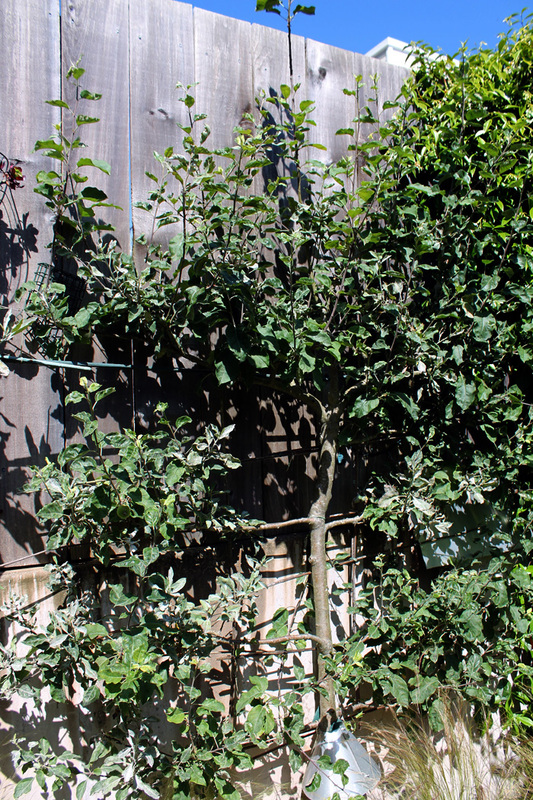 I have pretty well formed apples on some branches and still new flowers emerging on others. 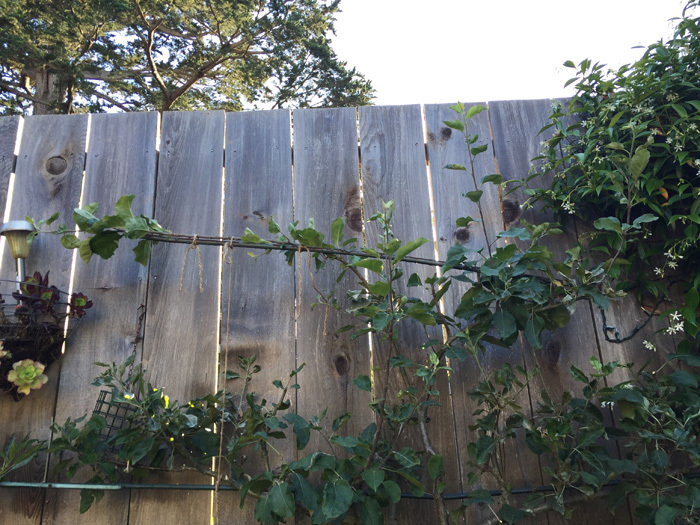 Btw, last year I got a double flower season on one of my other apple trees presumably because of the very warm winter we had. Obviously, anything that had an apple or a flower bud, I kept. 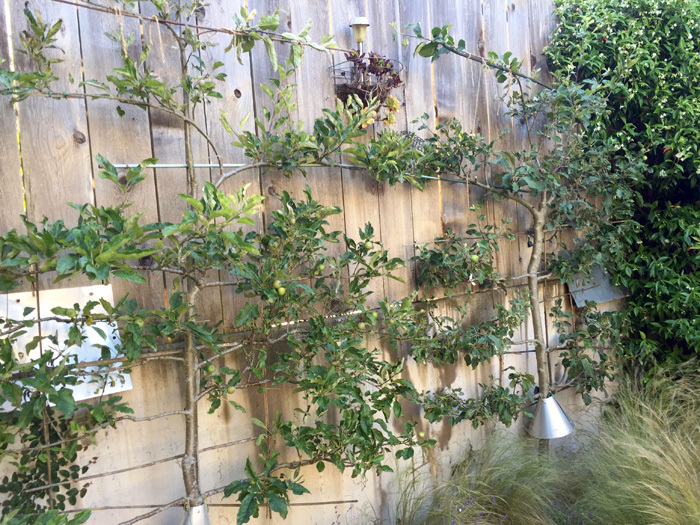 I pruned back the really long growths that were destroying the shape of the tree. On the mystery tree on the right, I tied down the leader to make a lateral branch of it. There is another guy there that I think will become the new leader. As for the mildew, I found this source for solutions. I took a two pronged approach. First, early in the day, I hosed the leaves down with a strong spray of water. 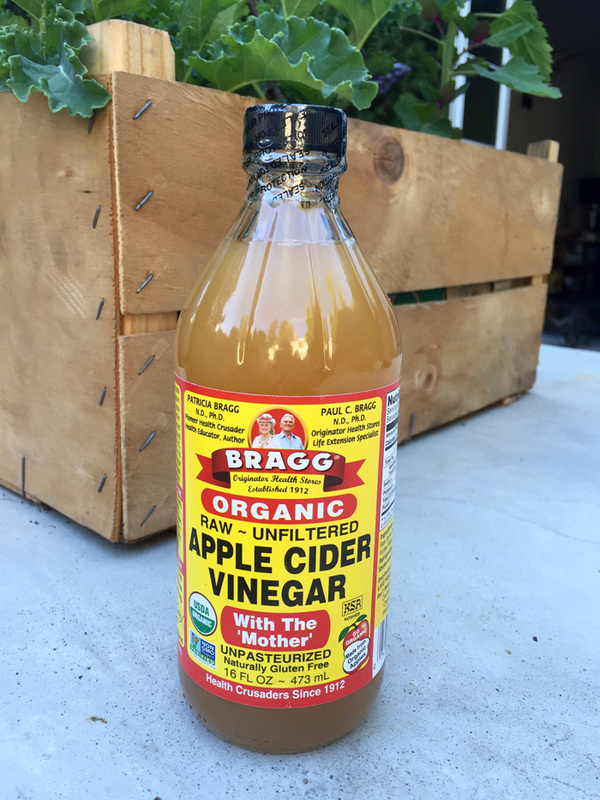 Later, I used a solution of this vinegar heavily diluted in water.